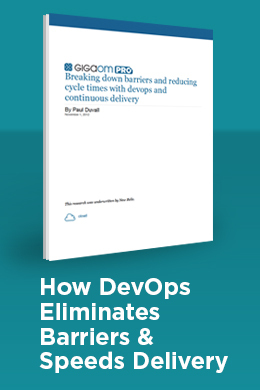 GigaOm examines the challenges and opportunities of embracing DevOps. Fact: Rapid communication and agile collaboration between your development and operations teams is more crucial to your business success than ever before. The reason for this is simple. As software continues to impact nearly every second of every single day, modern application users are increasingly demanding software that is stable, fast, and constantly being updated with new features. Of course, the best way to consistently deliver feature-rich software with speed and stability is DevOps. This eBook discusses the origins of DevOps and the benefits of embracing a DevOps philosophy to help us solve both our current and future problems.